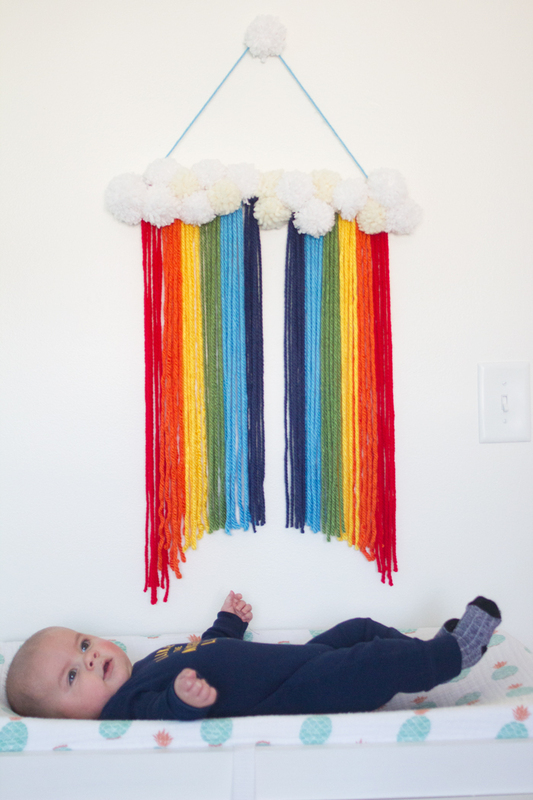 I knew early on that I wanted to make some sort of a wall-hanging to go above Olly’s changing table. 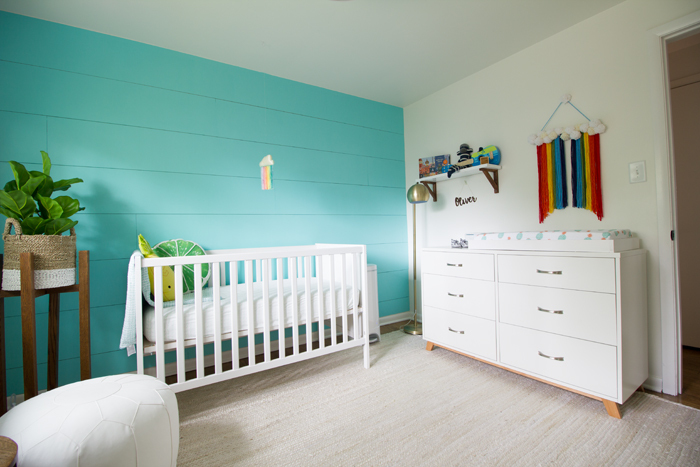 In his big sister Joanna’s room, we have large 3D paper flowers on the wall that she always enjoyed looking at during diaper changes. 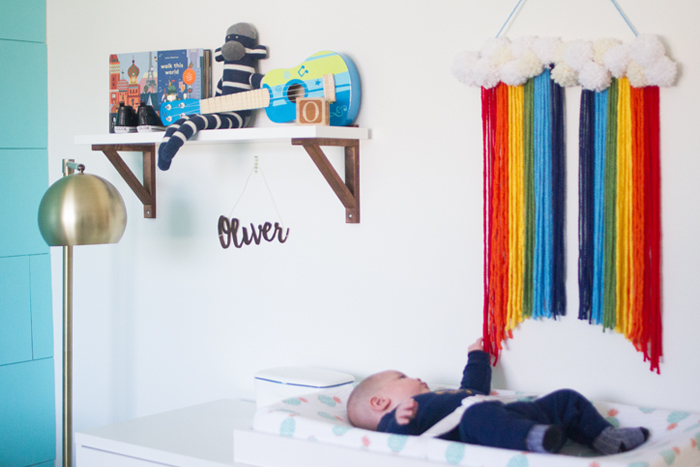 I wanted to make something that would be fun for Olly to look at, light enough that if he pulled it down it wouldn’t be terribly dangerous, and a colorful pop of color for that side of the room. Most of all, I wanted this project to be EASY! 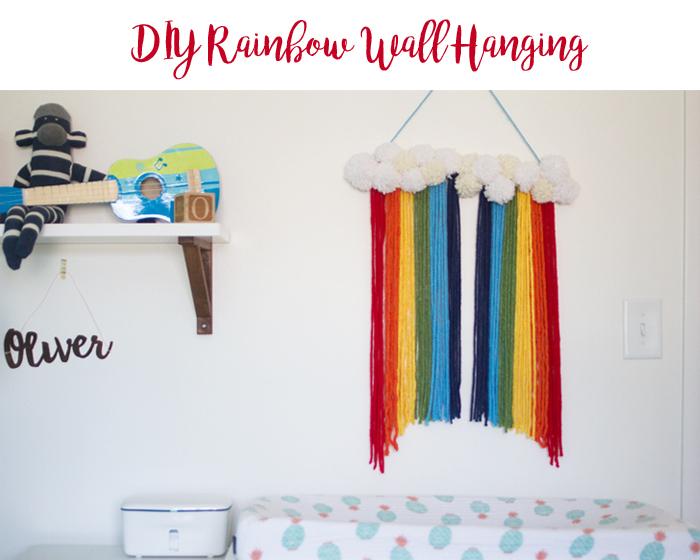 Most of the tutorials I found on other blogs and Pinterest were too elaborate for my time and patience levels (um, zero), so I brainstormed for a long time about what simple project I could do. I was SO excited once I had the idea to try to make a rainbow. I didn’t know if it would work, but I think it ended up super cute. And once you have all the supplies, this project could be done in just an hour or two. Just my style! something with an oval shape to trace. I used a platter, but you could also use cardboard cut to the right size and shape. Cut your dowel down to size if necessary. Cut a long length of yarn, fold it in half and loop it over and through the dowel. I’m sure this type of knot has a name that I don’t know! Cut your yarn longer than you think you’ll want it, since you’ll be trimming later. I cut 8 lengths of each color to have 4 on each side. Once the yarn is all tied on, cut the arch shape in the bottom. I laid everything flat, made sure the yarn was perfectly straight, and then used a large oval platter to hold down the yarn while I traced it with scissors. To cover the dowel, I made a bunch of white pompoms to look like clouds and tied them on in the back. I just tucked them in wherever I had room and tried to fill it up with as many poms as possible. I love making pompoms! I make mine by hand, the old-fashioned way, but there are a lot of methods. Tie a long string to each end of the dowel to use as a hanger. I added another pompom to hide the pushpin that I used to hang it. 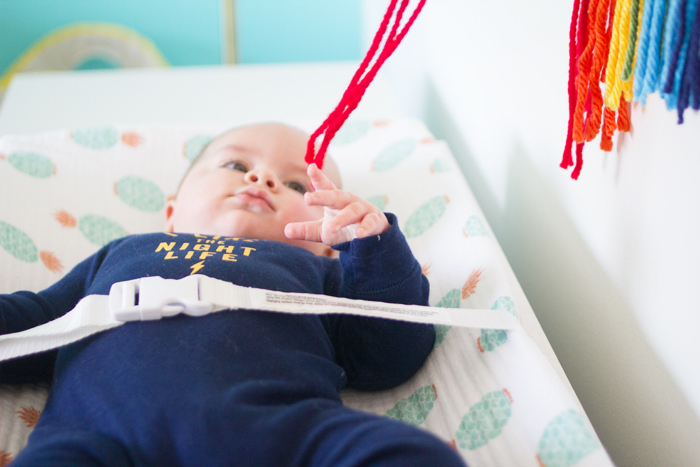 Olly loves to look at the bright rainbow colors during diaper changes and often reaches out to touch the yarn. I’d call that a success!